The mistake which gifted Moldova a route back into last October's World Cup qualifier in Chisinau indicated that Shane Duffy was still a work in progress. Martin O'Neill's decision to keep him in the side for the epic win in Austria a month later indicated that the manager had kept the faith. And that's why he will be very disappointed at the news that the Derry man is out of the World Cup qualifier with Wales on March 24 after suffering a broken metatarsal in Brighton's Championship defeat to Nottingham Forest on Saturday. The reaction of Chris Hughton and worried Brighton fans demonstrates the esteem in which the former Everton defender is held at the club he joined on a permanent basis in August. "We're probably looking at a minimum of six weeks (without him)," said Hughton. "It's a big loss for us." Duffy's move to Brighton only went through following a comically error-strewn final couple of weeks in the colours of Blackburn. Add in the memories of his dismissal in Ireland's Euro 2016 exit to France and there is a body of evidence to suggest that the strapping 25-year-old comes with a health warning. Richard Dunne offered a positive assessment, yet cautioned that Duffy had a tendency to force things and pose problems for himself. Reports from Brighton suggest that he has tidied things up in their promotion charge, so his loss is a blow for O'Neill, who has juggled his four preferred centre-halves over the past 12 months but gradually come around to the conclusion that the younger pair - Duffy and Ciaran Clark - were his first-choice options. 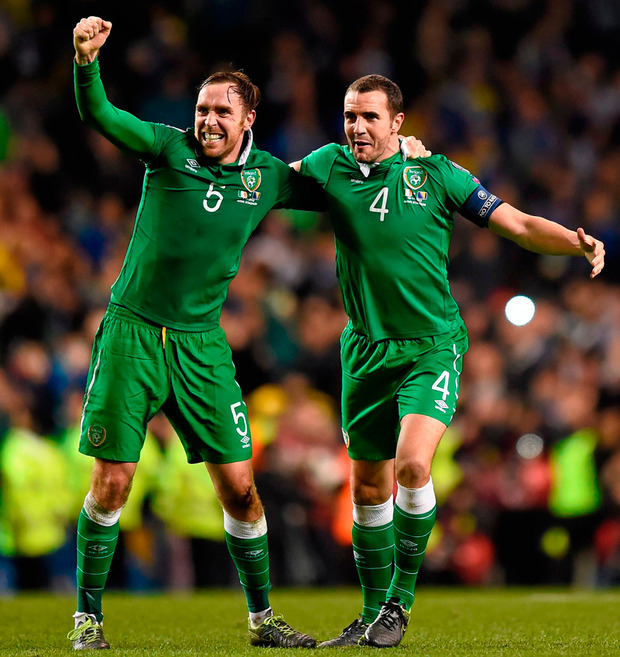 John O'Shea and Richard Keogh were picked for the campaign opener in Serbia, a game Duffy missed through suspension, but they took a back-seat for the three wins that followed. On form, retaining Duffy and Clark made sense. Their respective employers, Brighton and Newcastle, are on course for promotion and they are important players. By contrast, Keogh's Derby are having another frustrating campaign littered by inconsistency, although Steve McClaren continues to laud his skipper. Keogh does have a minor calf injury problem at the moment that brought an end to his run of 105 consecutive league appearances. The prognosis is positive from the Welsh perspective. But he might well find himself behind O'Shea in the pecking order. The veteran contemplated retiring from international football in the aftermath of France but O'Neill persuaded him to stay on because he valued his presence around the camp. It has been another testing year at Sunderland, with the threat of relegation now the default setting around the Stadium of Light. The great escape looks increasingly unlikely this time around. O'Shea has featured 21 times this term, with David Moyes parachuting him in and out of the side. He was selected for Sunday's loss to Manchester City. O'Shea and Clark were O'Neill's chosen combination at the start of the Euros but the manager broke them up after two games to try something different ahead of the magic night in Lille. Still, it was Clark's confidence that was fragile at that juncture and the combination of his energy and O'Shea's savvy could get the nod for the visit of a Welsh side that will be led by the considerable talents of Gareth Bale. With Robbie Brady already out of the equation due to a ban, O'Neill is now at the stage where every injury bulletin will make him nervous. He will name his provisional squad next Monday morning.